MOL Walkin Drive for Graduate freshers from 9th to 13th June 2014. MOL Recruitment Drive in Mumbai for freshers. Any Graduate freshers are eligible to attend this drive. Interested and eligible candidates can directly walkin to below mentioned address. Import: Data Quality Check on Import Manifest / Arrival Notice, etc. Export: Inputting the shipment details from Shipping Instructions for creating B/L. Graduate from recognized university with minimum 50% marks (Preferably Commerce / Science). Candidates who have appeared for the Graduation examination (In current Year without arrear papers) can apply. Diploma in Foreign Trade / Shipping Management / Logistics (preferred). Strong Keyboard Skills (i.e., Typing speed of at least 18 w.p.m. with more than 80% accuracy). 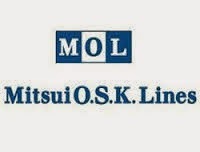 MOL-Information processing Services (‘MOL-IPS’) is one of the preeminent Back-office Shipping”s organisations. As a professional organisation we help our customers by providing 100% back – office support to all the regions through out the globe. Our aim is to deliver high quality services effectively, to our customer through process excellence.We play a significant role in the operation of our customer”s and regions. We take pride in the fact that our services add value by helping to improve transparency, trust and consistency of business processes.